This is an appeal on the outcome of my Pet Theft case. 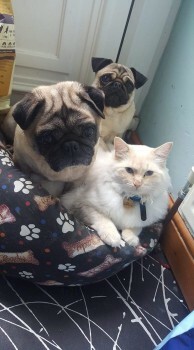 We attended Leicester Magistates court, on 4th December 2018, where Danny Simpson attended court for the theft of my two Pugs. Danny and Micky stole my dogs while we were away on our holiday with my family. They were builders who were booked in to do work in our home, yet waited for us to arrive in Spain and then they stole our much loved pets which had been in our care for several years. My dogs Betty and Harry are still missing!